This piece is in the words-on-paper phase of development. Much of what you read will change as the piece progresses. Please excuse typos, transpositions, cut and paste errors, grammatical and spelling mistakes and the other illnesses that plague books at this stage. 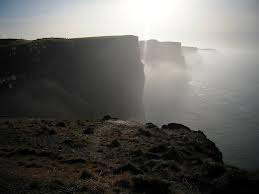 He stood, balanced inches from the cliff edge, facing the Irish Sea. The wind ripped at his clothing, straining its power to send him tumbling to the rocks and surf beneath him. His shirt snapped like a flag in a gale. The blowing salt spray sliced into the gaunt and pale skin on his face. He wanted the pain, sought out the punishment, but Julian Blessing felt it not at all. He stood unmoving and unmovable, suffering in a world caged by his own mind. He closed his pale gray eyes, eyes clouded with doubt, fear, anger and a bitter sorrow. He leaned his head back and his hands moved slowly away from his sides slightly. Julian cast his mind back. What he saw, what he felt was acrid recrimination as the deaths he had caused played back to him in an endless loop of accusation. “They say it isn’t the fall so much as the sudden stop that makes jumping a great deal less fun,” said an older man of slight stature, his face etched with the lessons that grow wisdom. The man looked over the cliff’s edge at the churning see below and shivered. “I needn’t worry about you, Julian,” the man said. His words were torn away on the wind, but Julian heard them. “You won’t jump. You feel the need to suffer.” The man cocked his head to the side and studied his patient. In his forties with gray hair tending toward white at the temples, Julian, although once of athletic build, had become slight. Little sleep gave him an unhealthy paleness. He was tall and the older man had to look up. Julian’s arms dropped back to his sides and he opened his eyes. The older man always registered uneasiness when he looked at the cloudy gray eyes of his patient. Julian seldom blinked any more and that only added to the doctor’s unease. “You are right, I won’t walk off the edge today. ‘Need to suffer,’ doctor? I would use the word deserve, but that sounds pathetic and I left pathos behind weeks ago.” Julian’s voice was a whisper with very little inflection. His speech was slow and deliberate. Each word chosen with precision from a mind roiling in chaos. The doctor had to lean in and concentrate to hear. “What can I do for you?” Julian asked. His forehead creased as he listened to the wind and waited. The doctor would answer in his own time. Minutes passed as the older man looked out across the Irish Sea to find an unseeable future. The wind and salt spray lashed both men. “Let’s go in. You may need to suffer, but I do not,” the man said. The doctor led the way across green lawns and down a main pathway. That, in turn, led to a covered arcade. As they walked, the only sound was their footfalls echoing off the stone walls and gothic columns of the monastery.